For Peace and tranquillity in the beautiful , Western Loire, a recently refurbished, rural ,self-catering gite with private garden and barbecue available, set in one of the most prettiest villages in the region. . Ideal for couples in search of relaxation in a romantic location. The perfect area to get away from it all and enjoy walking, cycling and fantastic bird watching, including buzzards, kestrels, sparrow hawks, hoopoe, swallows amongst many others. The Gite: The cottage at Les Hetres has been tastefully developed from an old country barn into a secluded, luxury, self-catering holiday home. The accommodation offered is well-equipped ,suitable for couples plus small child and or baby. The cottage has central heating and is designed open-plan with good size living/dining, bedroom area and a separate bathroom. The dining area/lounge has a table and 4 chairs plus a sofa bed settee. The kitchen is equipped with a cooker, including gas hob, electric oven, grill and cooker hood; fridge with small freezer section, microwave, oven, coffee maker, kettle, plus a full range of kitchen cupboards for storage and sink unit. Outside is a private patio complete with table and 4 chairs plus a barbecue. There is a lawned garden adjacent to the patio and plenty of parking is available outside. The owners are always available on site for help and advice and can offer a variety of fresh fruit, salad and vegetables for sale, plus home made jams and fresh free range eggs. The Area: Within 60 minutes drive from Les Hetres are the 3 major towns of Angers, Rennes and Nantes with excellent shops and restaurants. Each town also has an airport with daily flights to and from the U.K. There are market towns all around with a market most days of the week. The Loire region is renowned for its many beautiful chateaux and gardens, plus there are plenty of museums and local attractions to be visited in the area. The pretty ferry port and seaside resort at St Malo is a pleasant 75 minutes drive from Les Hetres. The gite has a separate bathroom including a modern shower enclosure with relaxing power jets, washbasin with mirror and cabinets, plus toilet. Towels are provided. A lovely gite with beautiful wooden beams. Perfect size for two and a dog. A lovely view of the surrounding countryside from the garden. Absolutely lovely hosts who do everything they can to ensure you have a relaxing holiday, including looking after our dog whilst we were at a wedding. Recommend for anyone wanting a quiet walking or cycling holiday. We just got back from our stay in the gite and have to say what a beautiful place. We had the best time ever. The gite so tranquil, the perfect place to unwind and enjoy the frence coutryside. The owners Alan & Rita are just amazing. They were so welcoming and so helpful, we have made friends for life thankyou to you both. We didnt want to leave its that nice. We are already looking forward to going back next year. Thank you alan and rita for a lovely holiday. A lovely, pretty guite in the countryside. If you want somewhere to relax and enjoy some peace and quiet then this is the place for you. Guite is impeccably clean and offers all you can want including BBQ and wifi. Lovely local villages surrounding it and a supermarket close by too, lots of lovely places to explore throughout Loire using this as a base. Rita and Alan are very friendly and welcoming. They are there if you need them but not intrusive at all. We would recommend and stay again in the future. Beautiful little cottage in a very pretty, tranquil setting near a beautiful, quiet little village. We stayed for 2 weeks (8/7-22/7/17) in this charming little gite with all required facilities including U.K. Television. Lovely garden and pond (particularly enjoyed by Bonnie our young Cocker Spaniel). Very friendly and helpful owners Rita, Alan and Baxter (English Setter). Situated less than 1 mile from the beautiful little village of Armaille. Within easy driving distance of the lovely, historic city of Nantes and many beautiful villages on the Loire. We were particularly taken by Saint-Florent-le-Viel and Chateau Gontier. All in all highly recommended. Thankyou Rita and Alan. We loved our week at Les Hetres! A lovely little gite which was exactly what we wanted. It's located in a nice quiet rural spot but is also well located for taking trips to other places like Anger which is only an hours drive away. There's an amazing view across the valley from Les Hetres too but unfortunately there were really tall crops in the field next door so we didn't get to enjoy it until our last day when it was cut down. Worth the wait though! We arrived quite late on the Saturday evening and the nearest supermarket was closed so Rita and her husband Alan were very kind and brought us some dinner and some wine to tide us over til the next day. We were made to feel very welcome there and all in all had a great time. I would definitely recommend staying here. Beautiful location, very tranquil near charming village. Delightful gardens. There were no shutters on the glazed front door, therefore a curtain or pull down blind needs to be installed. The windows needed cleaning...there were a lot of fly dirts on the inside....perhaps install fly screens? There were no small sharp kitchen knives and insufficient saucepans. There were only two glass tumblers, one of which was chipped. There was an ironing board but no iron. The nearest washing machines were at Super U in Pouance. We stayed in August but unfortunately there were not many good places to eat that were open in the evenings. We found two excellent restaurants, Le Cremet d'Anjou in Angers and Le Pigeon Blanc at Vern-d'Anjou. The owners, Rita and Alan are a very pleasant couple who live next door and are on hand if needed. The front door is only partially glazed and there is a curtain covering it. Some people like a little natural light to filter through and the gite is not overlooked, however we will look into installing an additional, heavier curtain as well. The windows (and floors) were and always are steam cleaned before new guests arrive ( we use Karcher steam and vacuum tools and can highly recommend them) - any "fly dirt" may accumulate during the Visitors stay, we do not check on a daily basis!!! There are sharp kitchen/cooks knives provided and there is a saucepan/frying pan for the four gas burners!?!?? If more SMALL sharp knives were needed, we would have been happy to provide them if we had been asked. There are about 20 glasses of different types, shapes and sizes; and as the gite caters for 2 people a choice of 10 per person is reasonable. However, had the guests informed us that one of the glasses was chipped, we would have replaced it immediately. Our guests were informed prior to arrival that the nearest washing machine was at Super U, Pouance (10 mins away). Most people, if they feel the need to do a machine load of washing are happy to use the facilities at Super U, whilst doing their shopping. There is a clothes horse which can be put outside the gite to dry any small items of hand washing. There are at lest 60 restaurants in the surrounding area ( 20 mins drive max), including Michelin star restaurant and if we had been asked, we could have informed the guests of their locations. The website clearly details what is provided in the gite and there are no surprises when guests arrive; one of our reviews states that "you get what is on the tin" and many guests tell us that it is exceptional value for money. After their first nights stay they (Peter and Veronica Mould ) were asked if all was O.k. - and don't hesitate to ask for anything ..... Peter replied that "it's fine, couldn't be better!" We aim to provide a relaxed peaceful experience at Les Hetres - if you need something then let us know! 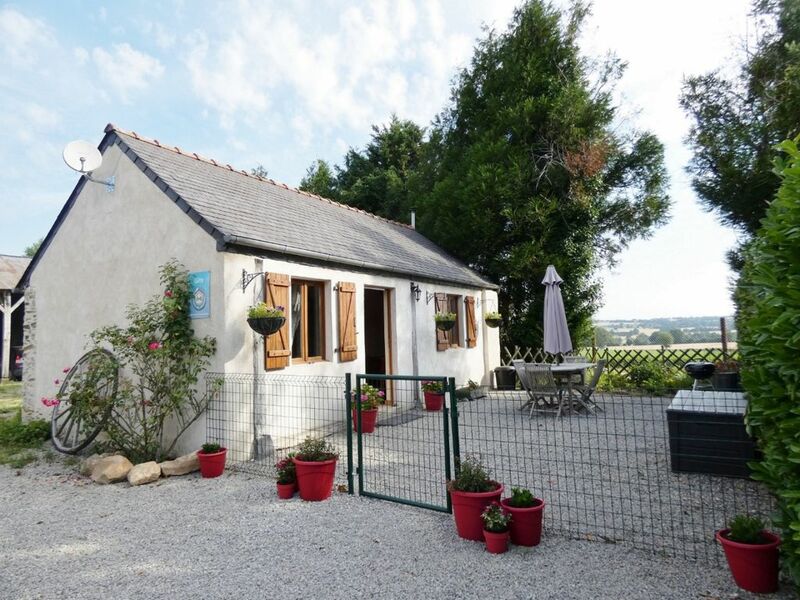 Set in a beautiful rural location in the pretty village of Armaille, near Pouance in the tranquil region of Western Loire , with stunning views to all directions; the Gite at Les Hetres is completely self contained, with its own patio, barbecue and private garden within the 4 acres of grounds. Armaille is a friendly rural community surrounded by farmland, ideal for cycling and walking. The village has its own cafe and the river Verzee runs through the centre of the village with excellent fishing. The town of Pouance is 10 minutes away by car, where there are plenty of shops, including 2 supermarkets, several good restaurants, parks, sports centres and a man-made beach next to a very large lake, where you can hire pedal boats, or fish from the other sides of the lake. There is also trout fishing nearby, set in the parc St Blaise. Within 20 minutes drive is the larger town of Chateaubriant with excellent shops, a variety of good restaurants.